"Are you ready to have some fun? " 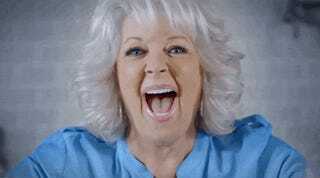 asks Paula Deen, as the rest of the world slowly backs away. There are so many great things about this commercial. What's up with the terrible aspect ratio? Is it just me, or are there some sexual undertones to this video? I'm feeling a little uncomfortable. Maybe it's time to end this story. AHHH! 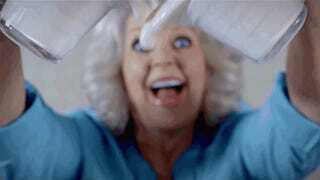 You scared me, Paula. Doesn't it feel like she's staring right at you?